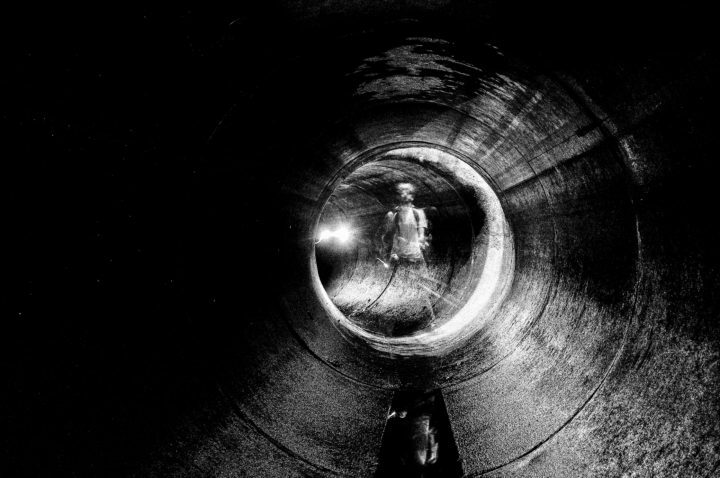 Portland photographer Nick Gervin stands in one of the city's subterranean tunnels he photographed for the first issue of his new zine, Machigonne. The images were made over the course of the last six years and the zine is due out next month. PORTLAND, Maine — Photographer Nick Gervin is best known for revealing the city’s nighttime street life, lighting up its dark corners with his camera flash. Gervin’s monochrome images often expose a hidden world of fights, drunks and those too tired to go any further. Next month, Gervin is set to unveil a new photo project. 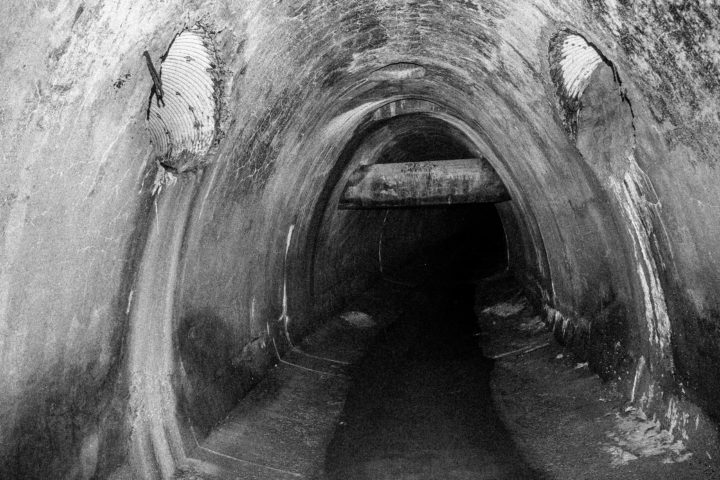 It’s an exploration of another unseen, dark slice of Portland: The city’s sewers. The underground images were made over six years, while Gervin methodically searched the city’s unseen depths. Though also black-and-white, his new pictures differ from his street work. Lit by flashlights, and his signature head-on camera flash, they are less specific. They suggest more than they reveal. The photos are set to appear in the first issue of his new, glossy, self-published zine “Machigonne.” The title refers to the original Native American name for Portland. A photo, taken beneath the city, by Portland photographer Nick Gervin. This image will appear in Gervin's new zine, "Machigonne" in April. Unable to work after his latest trauma, the camera gave him a creative outlet and helped organize his thoughts. 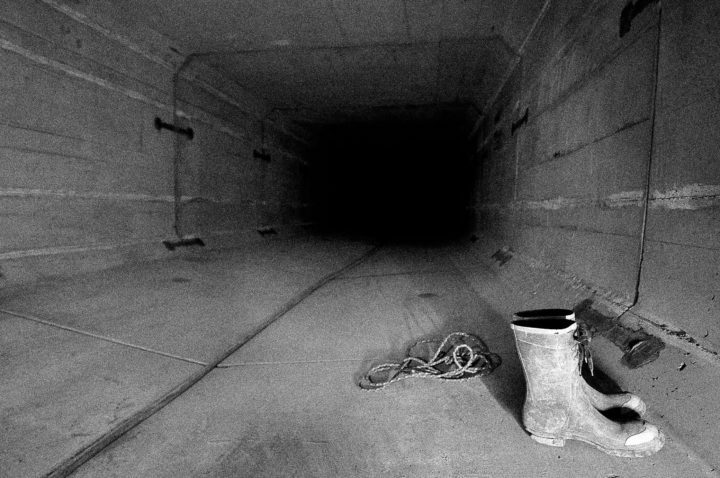 Seeking solitude at the time, photographing at night and underground were natural for him. Gervin is no stranger to self publishing, either. He put his first zine — short for “magazine” — together in 2014. Last year, he released a hand-bound, 190-page, hardcover book showcasing his photos of New England freight train graffiti and the artists who do the spraying. It sold to collectors, all over the world. Q: You’ve spent the last 10 years photographing exclusively in Portland. When did you start shooting underground? A: It was right after my head injury. I had a sensitivity to light and sound and, well, it’s really quiet underground. There are no people and the buzz of the city comes to a halt. The only thing you hear is the noise of running water, which I found soothing. And it’s fascinating. Q: I hear you first saw the subterranean city when you were a kid on Newbury Street. Is that right? A: Yeah, in 1991 or ‘92. I’m not going to say where but there were some things in that neighborhood we explored as kids. So, I always knew that stuff existed. Then, as an adult, when I started photography, I wondered if I could make a photograph of that stuff I saw as a kid and I found my way down there. Q: Were you in any danger, down there? A: Exploring underground is extremely dangerous. The number one rule is “when it rains, no drains.” If you’re underground and it starts to rain, even a little sprinkle, those drains fill up real fast. You’ll drown, plain and simple. There’s also trapped gases (down there). They’re odorless, tasteless. You’ll just start to feel funny and then you’ll pass out and die. 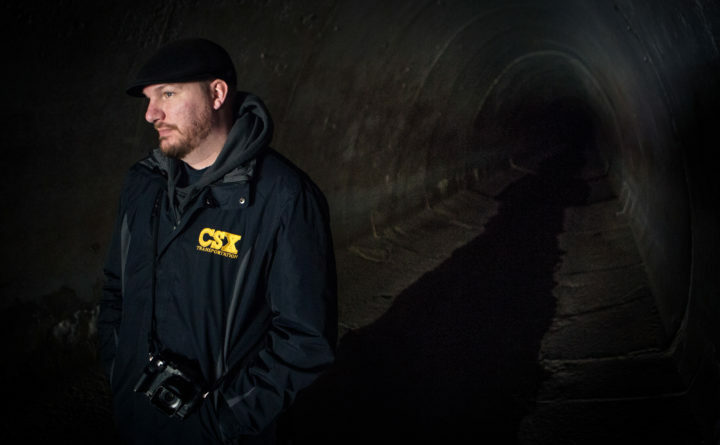 When I go underground, I use an air monitor that will tell me the carbon dioxide levels. Q: What’s it like down there? A: You’re stepping into history. I love this city and it’s kind of amazing. It’s cool to see something different in a city you’re so familiar with. I’ve explored every corner of this city and it’s like a living organism. It’s like a tree and (the sewer is) like its roots. It provides life to the surface. Without these (water and sewer) infrastructures we would not be here. Think about the last time you lost your power — well, most of the peninsula’s power is underground. We don’t even think about them when we’re walking above them. I find that fascinating. Q: Can you tell me exactly where you went and how to get there? A: No. I’m not going to share that information. There are two reasons. Number one, it’s dangerous. Two, nobody showed me where this stuff is, nobody showed me any of this. Q: This is a zine. Didn’t the internet kill zines 20 years ago? A: There’s been that notion — but absolutely not. People ask me: Why do you put so much energy into printing? There’s a really simple answer to that. I’m not a .jpeg-maker. I’m a photographer. To be a photographer, you have to — physically — make photographs. If you’re not physically making a photograph, you are not a photographer. You’re a hobbyist, you’re a point-and-shooter. Zines come from the do-it-yourself culture, the punk rock culture, the skateboard culture. They have always been a really good way to get your work out there. There’s something about sitting down with (printed) photographs. It’s the way you should consume photographs. Zines allow you to look at the fine details and contemplate images and image-making. Q: When will you run out of things to photograph in Portland? A: Never. In fact, I often stress over the fact that there are too many things to photograph. I have so many ideas. By the time I’m an old man, maybe I’ll be content with what I’ve accomplished but I always feel like there’s not enough time in a day to photograph everything I want to photograph.